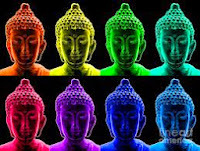 We visualize deities to connect with their enlightened energy, purity, and sacredness, which is our own nature as well. Anyen Rinpoche and Allison Choying Zangmo teach us how to visualize Avalokiteshvara, the embodiment of perfect compassion. We are constantly thwarted by our own expectations. For most of us, fantasizing about how things “should be” is a constant source of anguish. We wish our parents, our children, our friends, our jobs, our own health, and even the person standing in line in front of us at the grocery store would be just so. We often bring this hard-headed mindset to meditation. We may have had the romantic idea that meditation was about sitting in a candlelit, quiet room and “emptying” the mind of all of its conceptual thoughts, bringing us calm and blissful feelings. Meditation actually offers something much more revolutionary. If we do it right, it gives us new eyes, new senses, and a new world. It opens us up to a part of our own mind we’ve never seen or experienced before. If we have begun practicing the Vajrayana tradition seriously, we have probably found that this revolutionary approach entails much more than just sitting quietly in a dim room. Almost all Vajrayana meditation practice includes some component of visualization practice. It is also called “generation stage practice” (Tib. skyed rim) because we generate each aspect of a particular visualization in stages, honing our ability to focus and concentrate with each stage. Generation stage practice can seem contradictory to our expectations. 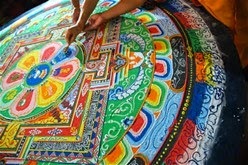 First, we might think that certain parts of Vajrayana Buddhism associated with this style of meditation practice—bright colors, ritual items, thangkas, the recitation of mantras and prayer sadhanas—are merely parts of Tibetan culture and should be excised from the American Buddhist tradition. Another idea we might have is that meditation should empty the mind of concepts. When we work with visualization practice, aren’t we just piling more concepts on top of an already conceptual mind? A third idea about visualization is that it is difficult, and that meditation should actually be natural, easy, and enjoyable. If we read the traditional sadhanas and texts that present the methods for visualizing deities—for example, the refuge tree or Vajrasattva—the instructions are extremely detailed; we feel incapable of even visualizing a very small part of what we are instructed to visualize. For that reason, we might think this practice is just not for us. However, in spiritual practice, as in life, our expectations are just that—projections and misunderstandings of how things actually are. I teach generation stage practice to Western Buddhists who have a great desire to progress on the Buddhist path and who are also open and willing to try something new. I believe that many Western Buddhists haven’t understood the proper context in which to place this practice, and for that reason, it is contrary to their expectations. I should say up front that generation stage is a difficult practice. Becoming skillful at it entails the same amount of effort, if not more, that we put into our professional careers, families, and worldly obligations. We have to let go of the idea that meditation is easy and natural, along with all of the other fantasies we have about ourselves and the world. Why is training in generation stage practice so essential to Vajrayana Buddhism? We can find the answer to this question within ourselves. It is likely that we became interested in meditation because we were tired of living with ourselves. The human mind is restless; it is unable to relax quietly even for an instant. The constant barrage of thoughts, emotions, judgments, criticisms, and obsessions is exhausting. Because the mind is dominated by conceptual thoughts and emotions, we aren’t open to other experiences. The mind cannot find even a moment’s peace, and neither can we. Although it may appear to be merely a conceptual exercise, generation stage practice is an excellent method for helping the mind find rest and refuge from the unceasing landslide of thoughts and emotions. When we are working to generate a visualization, we are focusing so fully that the mind has no choice but to drop the things it normally chases after. And this is not just true of our visual sense. Visualization practice is a multisensory experience. For example, when we recite mantras, we work with the sensory experience of sound. If we are working at the full experience of the visualization, even the senses of touch, taste, and smell are absorbed into that experience. So, we should understand that the purpose of generation stage practice is tied to pacifying conceptual mind. We may have the idea that we are simply overlaying more concepts upon concepts, but actually we are using the mind’s ability to focus to cut through conceptual mind itself. But the purpose of generation stage practice does not end there. To deepen our understanding of this practice, let’s use the simple example of visualizing Avalokiteshvara, the quintessential bodhisattva of compassion. He is an example not just of ordinary compassion but also of immeasurable compassion. 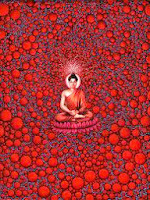 You may have experience working with a sadhana, or a ritual practice, that helps you visualize Avalokiteshvara in stages. However, such experience isn’t necessary. 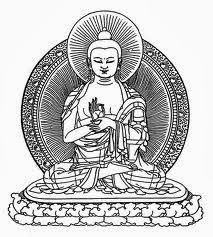 For the purposes of this explanation, we will rely upon just one verse as an invocation and refer to an image of Avalokiteshvara in his ordinary form: white in color, with four arms, seated in vajra posture, with two legs, and ornamented in the sambhogakaya style. And whose compassionate eyes watch over beings! Next, we work at trying to “see” some of the details of Avalokiteshvara’s appearance, which are present in the illustration. Here, we use the word “see” metaphorically. We aren’t capable of visualizing in great detail in the beginning, because we haven’t trained and practiced in this technique. Instead we “see” with eyes of devotion, our own conviction that it is just so. In the very beginning, we may find that while we wish to visualize Avalokiteshvara, we are unable to concentrate on anything at all. In that case, we can start very slowly. We could begin by visualizing Avalokiteshvara’s face. Perhaps even that is too much, so we may want to concentrate on the shape of his eyes or his mouth. Once that becomes easier, we can move to another part of his body, such as his hands. Slowly, over time, we will develop the ability to see all of the details of Avalokiteshvara’s form. Another method that we could use to train in visualization is to rely on an image of Avalokiteshvara: a painting on the wall above our shrine or a statue in our practice room. We could look at the image, concentrating on it deeply, then look away from the image and try to maintain what we saw. We can do this repeatedly, looking at the image and then turning away from it, in order to increase our ability to concentrate on Avalokiteshvara. We are not just trying to connect with an image of Avalokiteshvara as an exercise in shamatha, or one-pointedness. 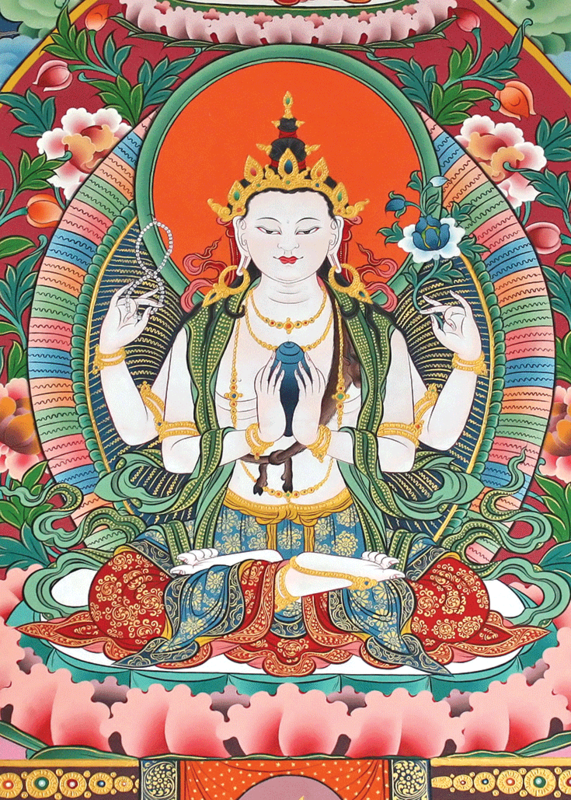 We are trying to connect with Avalokiteshvara’s energy, his great compassionate nature. Avalokiteshvara’s four arms are symbolic of the four immeasurable qualities of loving-kindness, compassion, joy, and equanimity. Generation stage practice is about trying to connect with Avalokiteshvara’s energy and using the mind’s focus and concentration to bring forth that energy in ourselves. When we visualize Avalokiteshvara in front of us, we may also want to visualize ourselves as Avalokitesvara, cultivating that seed of great compassion in ourselves. 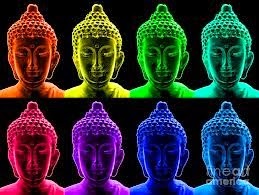 May all sentient beings have happiness and the cause of happiness! 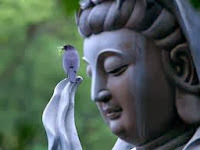 May all sentient beings be free of suffering and the cause of suffering! May all sentient beings not be separated from great happiness free of suffering! 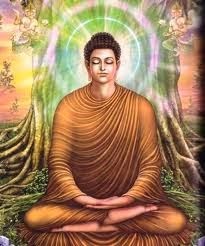 May all sentient beings dwell in great equanimity free from passion, aggression, and prejudice! Then we can return to visualizing when we are ready. One misconception we may have is that we should be able to maintain a visualization for a long period of time. 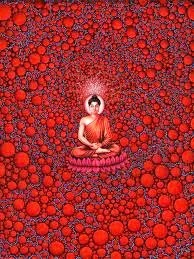 However, as with all practices of meditation, the experience of concentrated visualization will be momentary. In generation stage practice, we are also connecting with the energy of purity. Our ordinary minds constantly see individuals and the world around us impurely. Working with visualization practice, we are connecting with something that is sacred and completely pure. Avalokiteshvara is not merely a cultural icon of Tibet. He is an embodiment of complete purity, of enlightened energy, and of compassion. His white color is symbolic of his perfectly pure nature. Generation stage practice awakens the mind to what is called “pure perception.” Focusing on Avalokiteshvara’s pure nature can help us relate to the world in a less judgmental way. Our ordinary way of doing this is to avoid or push aside judgmental thoughts and ideas. However, when we engage in generation stage practice, the transformation of the mind is natural and very deep. We are not just superimposing some concept over our actual experience and saying, “Everything around us is good.” Instead, we are training in pure vision, in order to see the world’s pure nature. We are doing this through the mind’s concentration on a sacred expression of compassion and purity. That means we carry Avalokiteshvara’s compassionate energy and pure vision with us into the world, and also try to see that nature in others. We can even try to see others as Avalokiteshvara. Ultimately, the goal of generation stage practice is to awaken to the reality that all beings are indivisible from Avalokiteshvara’s own nature. Seeing ourselves, others, and the world around us through pure eyes thoroughly transforms our experience of life. And the benefit doesn’t stop there. Generation stage practice creates a chain reaction as we bring warmth, compassion, and openness to others, and into the environment around us. About Allison Choying ZangmoAllison Choying Zangmo has, with Anyen Rinpoche, coauthored five books, including Dying with Confidence and The Tibetan Yoga of Breath. Join Anyen Rinpoche, Karen Maezen Miller, and Josh Korda at “Finding Freedom from Painful Emotions,” this year’s Lion’s Roar retreat at the Garrison Institute, July 29-31. Click here for info and to register.